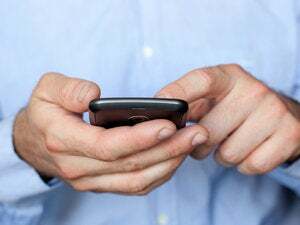 Free Smartphone Smackdown: What's the Best Deal? The Nokia Lumia 710, one of the first phones in the U.S. to ship with Microsoft's well-received Windows Phone 7.5 software, may have just arrived on the scene, but already it's priced as low as they go. Walmart is offering the Lumia 710 for free with a two-year T-Mobile contract. Over at T-Mobile, the phone sells for $50. How does the Lumia 710 stack up against other popular free phones? 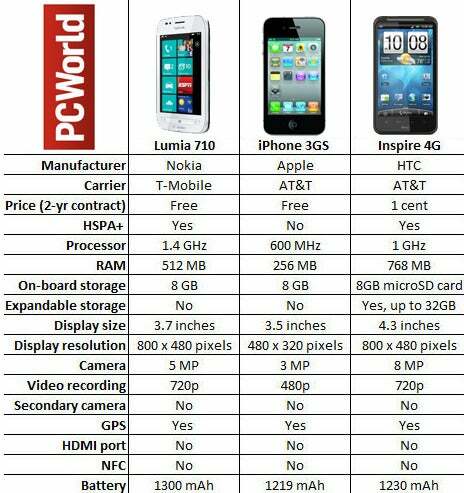 We assembled a quick tech specs chart to compare Nokia's handset with the Apple iPhone 3GS and the Android-based HTC Inspire 4G. As you'd expect, the 2.5-year old iPhone 3GS doesn't match up well in the features department. Its processor, RAM, and camera specs look particularly primeval when stacked against those of the brand-new Lumia 710 and newish Inspire 4G. Specs don't tell the entire story, of course, but the chart below suggests that Apple needs to pick up its game in a hurry. Today's free phones (OK, "free" with a monthly plan that factors in the price of the phone) are getting more powerful and feature-packed by the minute. The iPhone 3GS already looks long in the tooth. You can only imagine what impressive features its freebie competitors will offer in, say, another six months. The HTC Inspire 4G is an excellent addition to AT&T's somewhat bare lineup of Android phones, but we had a hard time achieving "4G" speeds in our tests. The Nokia Lumia 710 might not be the most powerful phone, but its reliable performance, array of business and entertainment features and crisp display makes it a top choice for first time smartphone owners and those on a tight budget.